Job Overview If you watch the weekly DomainSherpa interviews religiously and want to increase your knowledge, network and influence within the domain name industry, you’re the kind of person we’re looking for. 5. Potentially conduct interviews yourself! We need 5-10 hours of consistent work every week, but the hours will grow if you perform well. The ideal candidate will have creative writing and broadcast/podcast experience. There is also an opportunity for additional responsibility and income for someone that can prove to be a valued contributor. 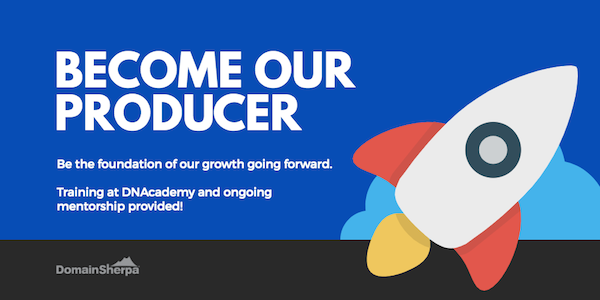 Training at DNAcademy and ongoing mentorship will be provided to the successful candidate. About Our Company Thousands of new businesses start up every day and each needs an Internet presence. But domain names are confusing to the uninitiated. What if you had a guide, someone to show you the way and make the journey easier? That’s our mission with DomainSherpa. Past experts (our sherpas) include Ali Zandi, Andrew Rosener, Frank Schilling, John Rampton, Noah Kagan, Russ Artzt and Shane Cultra. If you don’t know who those investors and entrepreneurs are, we’re not the right place for you to work. But if you do, apply to join us and you’ll get to connect with your domain name idols — and help them influence future generations of entrepreneurs and domain name investors. To Apply Please create a video of yourself and tell me why you think you’d be great as DomainSherpa’s Producer. Send a link to the video in an email to Michael Cyger at michael at domainsherpa dot com with the subject “DomainSherpa Producer Position”. Include links to your Linkedin and Twitter profiles. This is your first chance to make a good impression, so please take the time to do that.